As the editor of a wellness website, certified nutritionist and yoga teacher, you'd think that I've done a cleanse or two in my time. Contrary, I'm TERRIBLE at cleanses. I've tried several juice cleanses and failed at all—I distinctly remember during my first "3 day" juice cleanse I 'indulged' in cucumbers/EVOO/S+P on day 1, cucumbers/EVOO/S+P/parmesan cheese on day 2, and a vegan burger on day 3. i.e. I did not juice cleanse. I'm really active, have an affinity for food and pretty much eat whatever my body feels like (99.9% of the time very healthy, with the occasional Sunday funday calamari and fries). 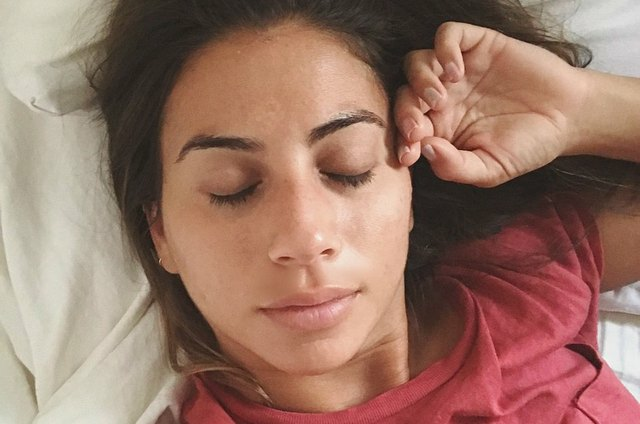 But the first two weeks of July included so much traveling and entertaining, I felt really depleted and "gross," for lack of a better word. I decided that it was time to reset my body with a program that I could sustain—which brings me to Sakara. 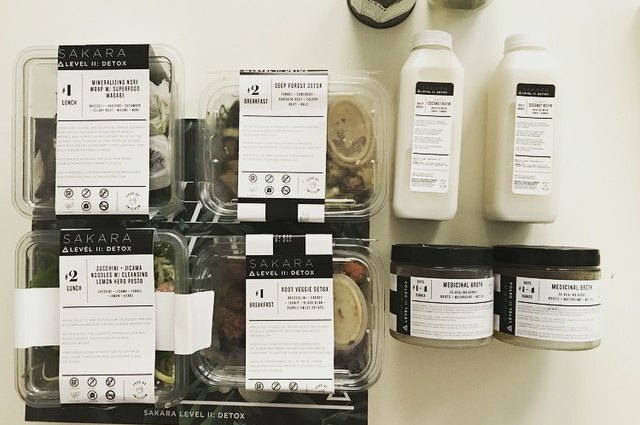 If you're unfamiliar, Sakara is an organic, plant-based, nutritionally designed meal delivery program. 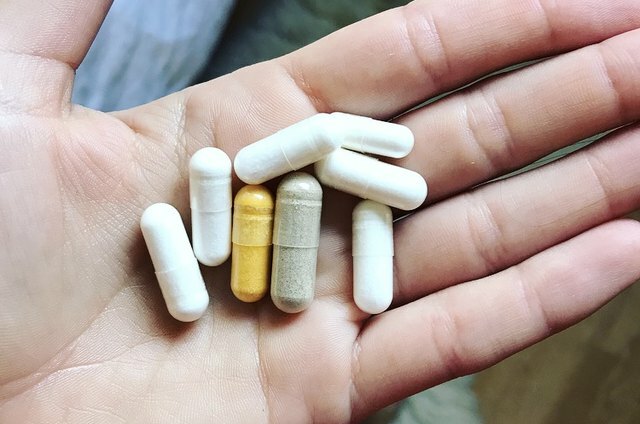 Their staple program is an incredible way to reset your body with plant-based fuel, but they also recently launched their first Level 2 Detox Program. This is the one I tried, it's 5 days. I received two full days of meals in one delivery, and the other three in another (so it didn't take up my entire fridge and they were really fresh). It's important to note that I was a barista for about 5 years throughout college/internships and feel like I have a huge tolerance for coffee and can fall asleep immediately after a cup. I woke up a little bummed that I couldn't enjoy my morning cup of coffee in bed, but other than that, excited for this cleanse to start. I had to run to a 7:30AM client, so I downed a glass of the Beauty Water (+ Silica & Rose) and headed out. When I got home, I had the first meal: Root Veggie Detox. It's made with broccolini, carrot, turnips, black beans, sweet potatoes - it was actually amazing and I was so full, I ended up heating it on the stovetop. Veggies for breakfast? WIN! I also took the supplements that they give you for energy throughout the day. I truly didn't get hungry until about 11:30AM. I had a meeting and I didn't want to not get anything so I opted for an iced cup of cordycep tea with coconut milk. 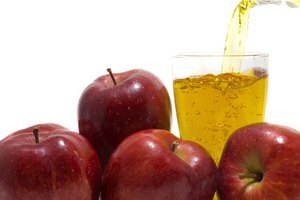 Not included in the cleanse delivery but not "cheating" via the guidelines of the cleanse, either. Then I got back to my desk and had the Mineralizing Nori Wrap w/ Superfood Wasabi. It also came with a big portion of mixed greens underneath. Nori wraps aren't my favorite, in general, but it did fill me up. A little messy for a desk meal. I also had a cup of the detox tea from Sakara and wowww - BITTER. But I guess that's how your tastebuds learn to stop craving sugar? Woke up feeling pretty good! This morning's breakfast was the Deep Forest Detox, including fennel, sunchoke, burdock root, celery root and kale. I liked Day 1's breakfast better but this was still pretty good - I was so full I couldn't even finish it. I brought about 1/4 to my office to eat mid-morning. The nutrient density was real. I heated this up on stove top, too. Woke up feeling a little sluggish - not tired, and I still haven't had any caffeine headaches yet! I took it easy and enjoyed the Magic Mushroom Detox, warmed up - might be my favorite meal so far. Today was going to be an extremely long day because we shot a Wake Up With video. Lunch was a broth with dumplings, in the Facebook group that Sakara created, a lot of the other participants said that the dumplings were amazing cold. So I ate them cold, in the car, on the way home from the shoot - ate the broth at home later on (warm!). I truly wasn't hungry and only felt the real "detox" stress when I realized I couldn't stop and get an iced coffee or matcha on my way home from the shoot (my favorite thing to do). That's the one major thing I learned during this program (continued under Aftermath). Friday night I had tickets with my girl friends to see Grease at Malibu Wines. Soooo I was literally sitting at a picnic filled with cheese, prosciutto, wine, crackers, bread, and couldn't eat any of it. That was pretty rough. BUT - I brought peeled & sliced carrots, parsnips and cucumber drizzled with olive oil and sea salt, Mary's flax crackers (made with just flaxseed & apple cider vinegar) and seaweed. LOL. I wasn't hungry though... and I was DD. This was the hardest day for me because it was the all liquid day. Thankfully it was a Saturday where I didn't have any plans or obligations. 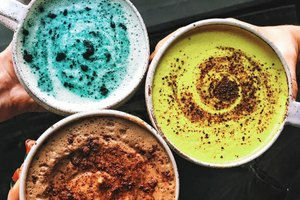 I almost quit because the juice still had the pulp in it (again, the texture thing) and I could hardly drink it... but then, another tip from the Facebook group, blend it up! So I blended it with a splash of the Coconut Kefir and it was good-to-go. I pretty much shrugged around Venice all day and laid on the beach, so I didn't work up much of an appetite. Lunch was another green juice and Carrot Ginger Alkalizing Soup. Dinner was the broth, and I went to bed at like 9PM. I almost called it quits this day but I was feeling pretty light (no inflammation or bloating) and I knew it would be worth it. Yesss LAST DAY! Breakfast started with the Sunshine Squash Protein Frittata which was SO good, maybe because I hadn't eaten solid foods in 24 hours? I had another easy day today and decided to go to the Hollywood farmers' market to load up on healthy stuff for the week ahead... also throwing in Redbread's buckwheat linguini and mini everything bagels - it was obviously what I was craving. Honestly, I felt really energized during the whole cleanse. Except on Friday, I tried to take a tabata class and quickly felt like I was going to fall over - so I ended up leaving. I wasn't upset or confused, though, my body wasn't really getting much protein to work through a class like that. Other than that, I kept explaining to friends that I was "sluggish" more than anything. Not the 'I'm gonna fall asleep at my desk' kind of tired, but... lazy? I also didn't experience any caffeine headaches, and I have 1 cup per day normally! I don't weigh myself so I'm not sure if I actually "lost any weight," but more importantly, I felt really light. I felt no inflammation or bloating, my clothes fit great. I felt really confident. I definitely have blemish-prone skin and was dealing with some under-the-skin stuff prior to starting the cleanse. In the detox packet, it says that some may experience "purging" during the cleanse because you're releasing so much. I did get another zit or two while I was on it, but they healed quickly and the days after, my skin was really clearing up. 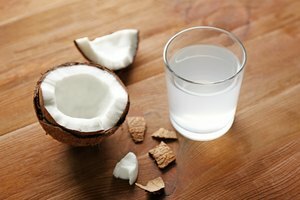 There is definitely something to the dairy, sugar, gluten, alcohol elimination - and I plan on continuing to try this out towards the end of the summer to see if it helps with acne. Honestly, the fact that I didn't experience hunger during this whole cleanse was REALLY shocking. 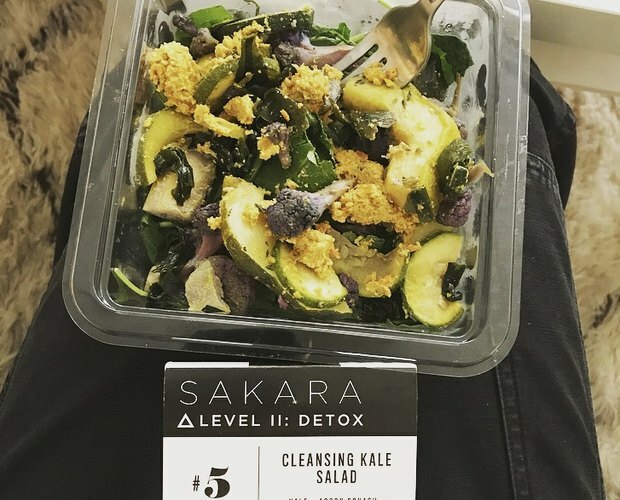 The only thing I noticed was that I felt "left out" not being able to go out to eat or anything because you're theoretically supposed to only eat/drink what Sakara sends you for optimal results. This was the toughest part, by far (I'm a foodie and pretty social). But it made me realize how important it is to only eat enough to be satiated, not to completely stuff yourself. 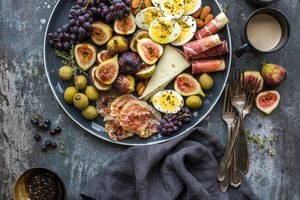 It also made me realize how eliminating any unhealthy gunk from your diet can totally change the way you feel - it (almost) makes me not want to eat my weekend calamari and fries! Okkk.. I said ALMOST makes me not want to eat my calamari and fries. I totally slipped up while I was with my friend the next day and ordered a burger and fries, and OMG - my stomach was killing me. It hurt and I felt terrible. Lesson learned. Also: Sakara warns you about this but I decided not to listen. 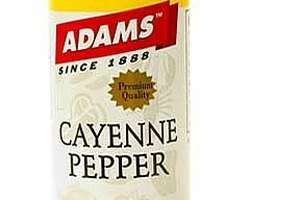 Never again, it's important to ease your body into this. I did have a cup of coffee the next day but I didn't really notice a difference in my energy levels - just a comfort of being in bed with a nice warm mug. Maybe I'll switch to tea going forward? 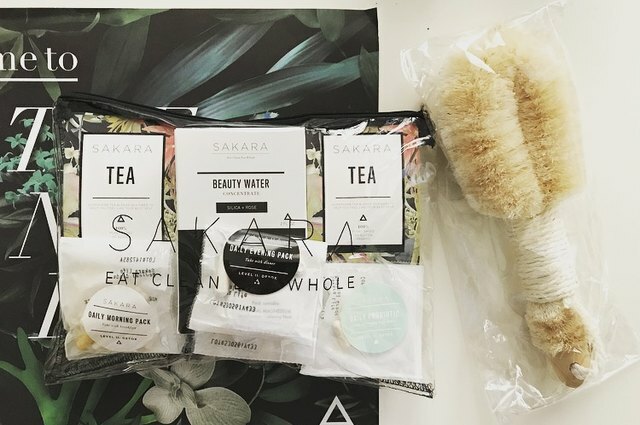 I was also lucky enough to experience two full days of Sakara's regular meal delivery program afterwards. The portions were 2x bigger and the food was delicious - unique, flavorful and easy to eat. An elimination diet can tell you a lot about yourself, your cravings, habits, relationship with food and what your body really needs. I thought I was going to be dying from the sugar elimination but I found I was actually craving carbs the whole time, not sugar. It's so important to take a few days every so often to bring your body back to basics in what it needs nutritionally. I would highly recommend this program to anyone looking for a refresh, that's NOT a juice cleanse. P.S. This content was not sponsored by Sakara, although I was gifted the detox. All thoughts and feelings are my own.